So… you want to collect private information on a public device do you? This is a common problem in retail and extends to many industries. You’ve successfully engaged the customer with an innovative and interactive public device, now you want to take the conversation to the next level. Perhaps authorize a social activity, collect some personal information or complete a monetary transaction. This is where you will likely lose your customer. XOMNI has solved this problem via the cloud as a secure orchestration mechanism. Imagine a scenario where the customer’s mobile device can be leveraged at any point in the public experience to provide a secure, private and efficient input experience for sensitive information. The XOMNI Cloud Platform solves this problem in a very eloquent way, empowering developers to easily integrate such a solution into their applications. If you have desire to dig a little deeper don’t hesitate to reach out to sales@xomni.com for more information. This entry was posted in Announcements and tagged Cloud, Collect Personal Information, Private Information, Private Input, Public Kiosk, Secure, Social on December 17, 2014 by XOMNIAN. Highly templatized one-size-fits-all solutions are not the future of retail. 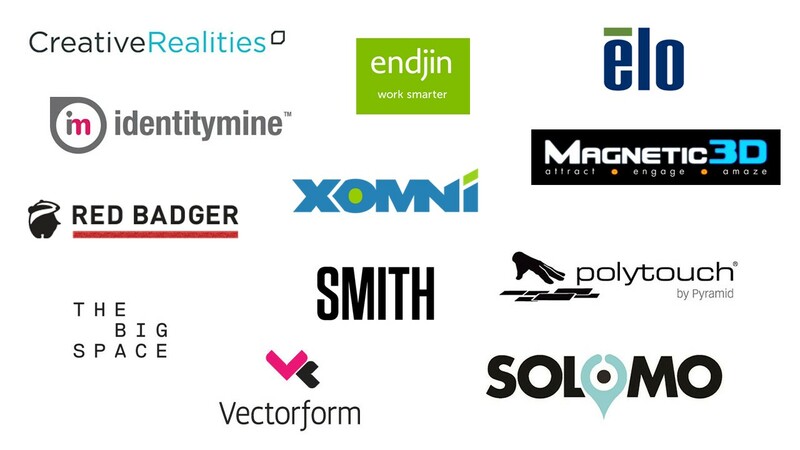 Come see Vectorform present a Cloud + Creative model to building Retail Experiences. These seamless omnichannel experiences are not just visually appealing and engaging. 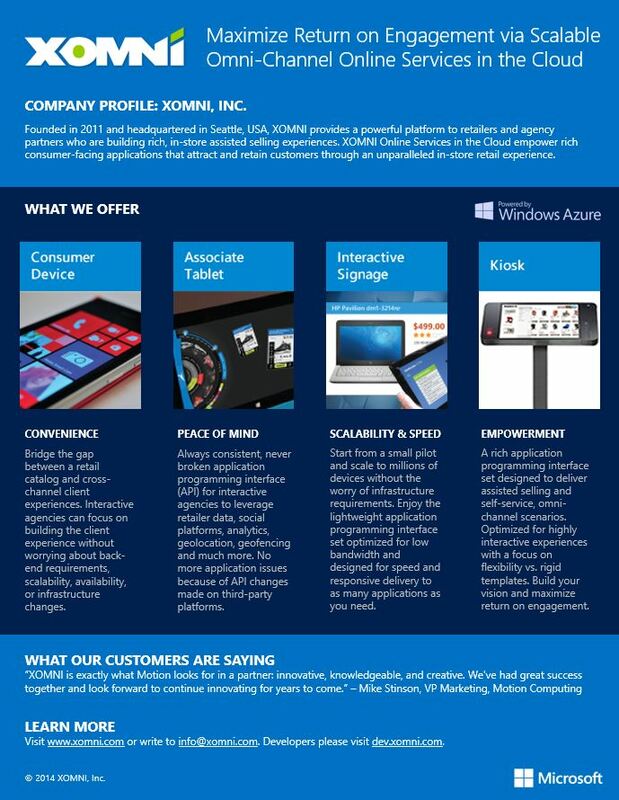 XOMNI powered experiences are backed by the Cloud offering extreme scale that’s easy to deploy and manage. Vectorform will be showing off a new universal application they developed which will help those wishing to build rich XOMNI powered experiences get a head start. Limited space is available. If you are in the Boston area don’t miss it! Sign up here. This entry was posted in Announcements and tagged Cloud, Creative, Experience, retail, Vectorform on October 31, 2014 by XOMNIAN. How does one power or enable unparalleled user experience? First, you need to involve someone with a solid understanding of “user centered design” and the ability to tailor a process for defining such an experience. Like these folks. Next, you need to break down all the typical barriers to design execution: Data access, channel access, (omnichannel integration), technology integration, performance and constraints associated with delivering the “design” to the targeted client platforms. Finally, you need to provide support so the players involved can focus on their core business. InformationWeek just published an article which illustrates one aspect of our core business – Cloud R&D. XOMNI is constantly on the hunt for new partners and technologies to support unparalleled user experience. We have a team specifically designed to learn all the hard lessons associated with new technology and their application within the cloud – so you don’t have to. We absorb those technologies that are ready to add value and enhance them in ways that benefit specific use cases and make them easy to understand and consume. Please have a look at the InformationWeek article to see the latest technologies we are assessing and sure to benefit the User Experience! This entry was posted in Announcements and tagged Azure Search, DocumentDB, InformationWeek, omnichannel, User Experience on September 30, 2014 by XOMNIAN. Concierge Applications. What are they? The term is currently a “catch-all” for applications touching on a variety of in-venue functions that support customer questions or request for services. These applications take many forms and run on a variety of devices such as Interactive Digital Signage, Kiosks, Associate Tablets or even the customers own mobile device. Concierge Applications can be an evolution of existing functions such as Way Finding, Assisted Selling or Price Lookup services. However, they can also be an opportunity for NET-NEW innovation. For example: Using the very latest in geofencing, audience measurement, facial recognition, social integration and suggestion engine technology to expose new workflows on top of existing CRM, Loyalty, Product and Inventory data. At XOMNI we help our customers quickly test and ultimately scale Concierge functions in their environment by providing rich data integration, content delivery and relevant out of box functionality. Over the coming months leading up to NRF 2015, we will be talking more about the future of Concierge applications and showing examples as they become public. If you have an interest, be sure to follow us on Twitter. For now, here is our example from NRF 2014. If you haven’t already seen it… check it out. This entry was posted in Announcements and tagged Assisted Selling, Audience Measurement, Concierge, CRM, Digital Signage, Way Finding on July 2, 2014 by XOMNIAN. This entry was posted in Announcements and tagged CreativeRealities, elo, endjin, identitymine, Magnetic3D, Partners, polytouch, redbadger, retail ecosystem, Smith, Solomo, TheBigSpace, Vectorform on May 6, 2014 by XOMNIAN. Speak Magazine just launched the digital edition of their summer 2014 release. We enjoyed this edition immensely for two reasons. First, we saw some very compelling arguments for enhancing the in-store retail experience and providing an enhanced guest experience for hospitality. Very important topics for the foreseeable future. Second, XOMNI happened to be mentioned several times in these articles! Have a look, you will enjoy them! This entry was posted in Announcements and tagged hospitality, omni-channel, retail, Speak Magazine on April 25, 2014 by XOMNIAN. This entry was posted in Uncategorized on April 14, 2014 by XOMNIAN. We updated our product brochure for NRF 2014. Let us know what you think! This entry was posted in Announcements and tagged Assisted Selling, Brochure, Cloud, in-store, NRF, Offline, xomni on February 14, 2014 by XOMNIAN. Is there a place for 3D in Retail? A few weeks ago prior to NRF we put together a tongue-and-cheek blog post suggesting the availability of a 3D iPhone for retail. Obviously there isn’t one. If there was, we’d know about it because that’s our job… to know about innovation in retail and help make the adoption of such innovation easier with cloud and saas strategy. For those of you who don’t know, XOMNI is a cloud platform that makes development, deployment and scale of assisted selling and self-service experiences extremely cost effective. 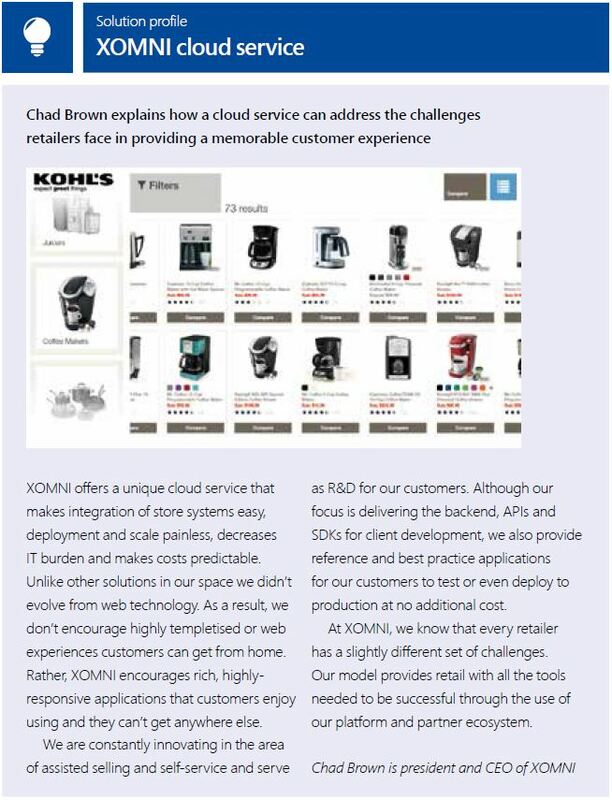 Yes, there’s a lot of people talking about the cloud, but we are highly focused on improving the in-store / on premise shopping and decision making experience for retail. That’s unique. To help our customers be successful we’ve brought together best of bread channel partners that fall into two categories. 1) Agency Partners – Companies that help with the design and development of any given experience. 2) Technology Partners – Companies that contribute to specific technology or infrastructure required by the experience. Magnetic 3D is our latest Technology Partner responsible for no-glasses 3D hardware and related services. We recently partnered with Magnetic 3D to demonstrate how 3D could be used in the retail environment. Our experiment at NRF uncovered 3 obvious areas where 3D and specifically no-glasses 3D could benefit retail. Attract and Initial Engagement. – It doesn’t matter how cool of an interactive experience your technology enables, if no one approaches it, it’s irrelevant. No-Glasses 3D tends to stop people in their tracks. We like this option for the initial attract mode. Enhanced Collaboration. – Associate devices will become more of the norm in time. Extending the associate experience with the help of larger displays is an obvious next step. We are enabling that now with a technology called Omniplay which identifies compatible displays in the retail environment and then allows the associate to send all or part of the experience to it for a more collaborative and social experience. With Magnetic 3D you get that + an extra 3D wow moment. Enhanced Endless Isle. – Floor space is always a premium. Because of that we get requests to enable endless isle scenarios. In other words, highlight available product that’s not on hand. What is the next best thing to having the product on-hand? Full motion 3D video of the product. Is there a place for 3D in the retail environment? XOMNI puts a powerful engine for creating rich interactive experiences in the hands of retailers and Agencies that support them. Adding Magnetic 3D technology to our ecosystem gives many retailers that extra boost they’ve been looking for. This entry was posted in Announcements and tagged 3D, Digital Signs, Magnetic 3D, Omniplay on February 4, 2014 by XOMNIAN. By way of our technology partners from Pyramid (The makers of the polytouch device) XOMNI will be showing our technology at ISE this year. 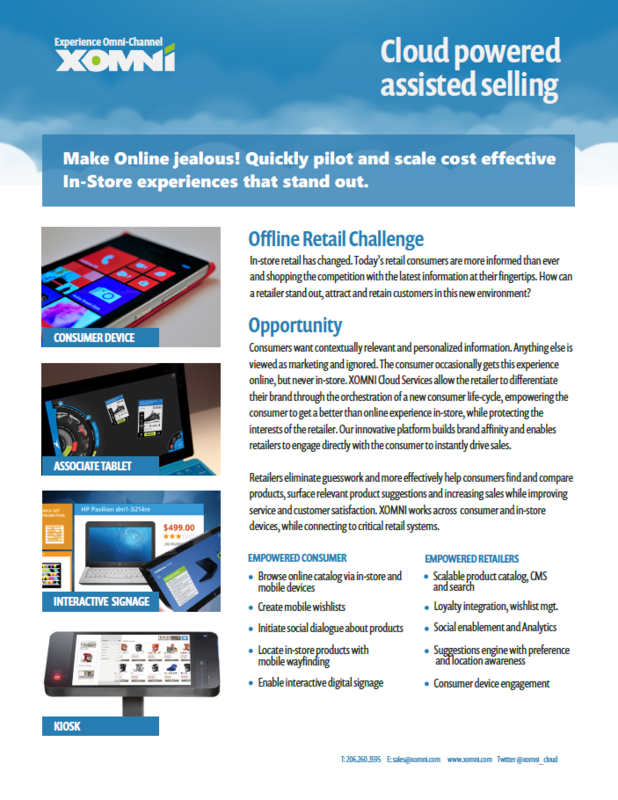 Specifically: Come see our Retail cloud platform demonstrated at the Integrated Systems Europe (ISE) 2014, Amsterdam RAI, February 4-6 (stand 8-H270) . Pyramid announced it will be showcasing a new 46” polytouch self-service table for retail banking environments alongside new polytouch multi-touch terminals equipped with switchable privacy filter technology. We look forward to seeing that. 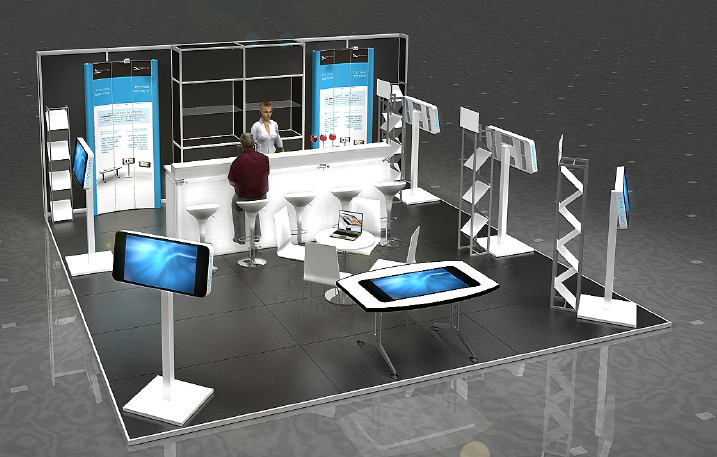 Here is a mock-up of the polytouch booth. (below) Well done! This entry was posted in Announcements and tagged Assisted Selling, polytouch, retail banking, self-service, xomni on February 3, 2014 by XOMNIAN. © Copyright XOMNI 2012. All Rights Reserved.